What are the key ingredients that drive success in startups? How do entrepreneurs capitalize on new ideas and bring them to market? How is an entrepreneurial mindset different from a managerial one? This course engages with these and other key questions and enables students to understand how entrepreneurs are able to connect the dots to recognize patterns, visualize opportunities and get a feel of the language entrepreneurs engage in the business world. Students try to draw conclusions whether entrepreneurship should be confined to establishing and running a venture or it can be a mindset that they follow through their lives. What tools do entrepreneurs need to successfully launch new ventures? What legal entity should a startup adopt? How do entrepreneurs raise funds, establish a team and get their venture of the ground? What are the key ingredients of a successful start-up? 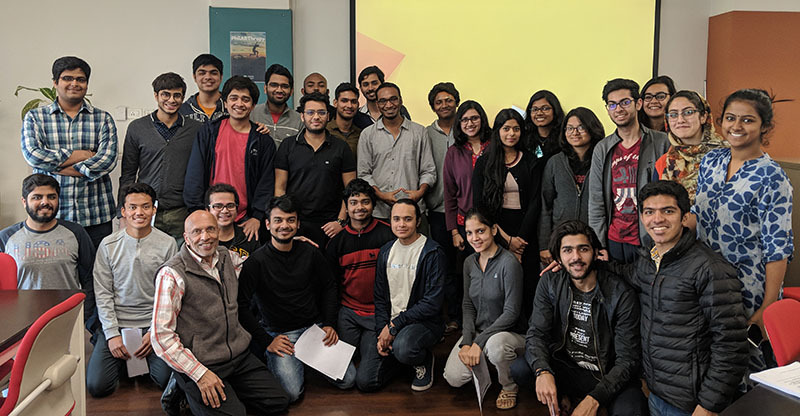 Through a mix of case discussions, assigned articles and in-class activities, students learn the start-up process in establishing a venture, and get a feel of the practical challenges and opportunities involved in building ventures and the rewards it offers. It is often said that “Today, thinking is more important than knowing”. Opportunities are what we all look for and their counterpart — the problems — are what we need to solve in daily lives. The dynamic environment of the twenty-first century requires more creative skills from citizens than just analytical skills to manage in the ever-changing work environment. This course is designed to help students develop the ability to think of solving problems in new and interesting ways. Living in India, one does not need facts and figures to understand the monumental challenges faced in the process of development and the need for social change. The idea of “Social Entrepreneurship” today captures much of the innovative thinking that has emerged over recent years to overcome these challenges. By seeking to merge the creation of societal value with more market like pursuits, it seeks to engage individuals who are interested in contributing to society but are either wary of or intimidated by the traditional actors in the social space. However, the increased attention to the sector has also lead to recognition of its limitations. This course tries to understand private actions that engender social change and sources of resistance and threats to it. Independent Studies module enables students to work on various projects where they are exposed to individual-based research and report writing under the guidance of faculty. Students have to undertake extensive research involving interviewing experts from the respective fields and ensure in-depth investigation and analysis on the selected topic to publish their final work. Ashoka’s summer study abroad programme offers students a unique opportunity to extend their semester learning experience by taking courses taught at partner and other international institutions. Every summer, international summer schools offer undergraduate courses in different subjects and fields. These courses enrich the undergraduate learning experience and can be transferred to the total credits. Students have undergone various venture Immersion Programs and Entrepreneurship courses abroad including Tel Aviv University, Israel and University of Cape Town, South Africa. Students get the chance to visit a number of accelerators and interact with successful entrepreneurs and learn from them. They also shadow entrepreneurs and work on assigned case studies relevant to visiting startups to come up with innovative solutions, adding value to the start-ups and founders they visit and interact with.